Priority‘s production planning facility includes a unique feature that performs forward scheduling followed by backwards scheduling (most other systems schedule backwards and then forwards). Forward scheduling not only ensures that no work is planned before materials are available, but also pinpoints the earliest possible completion date of any given order item. Backwards scheduling enables production to follow the rules of JIT (just-in-time planning). That is, if it is clear that a component for a given assembly will not be available on time, the production (or purchase) of the remaining components of that assembly is likewise postponed to the latest possible start date (where the user can regulate the delay). A wealth of parameters that determine the standard time a job will take, percentages of scrap, lot sizes and the like. Before production planning is run, the planning data used by the program are updated and frozen. This prepares for a new planning cycle which wipes clean the results of the previous cycle and takes into account updated data (such as current balances, due dates of open purchase orders and the like). 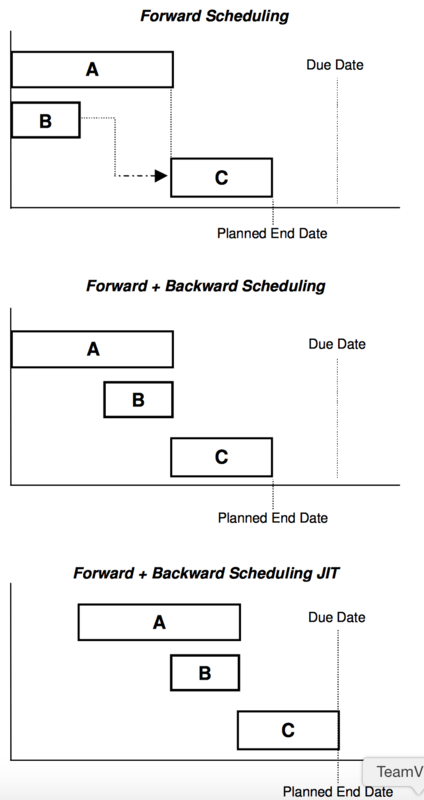 • Forward and backward JIT scheduling. Once the option has been selected, planning is carried out separately for each group of orders, according to Priority. Planning for a given order group takes into account data from the previous planning session. This option is recommended during initial planning simulations, as it provides a precise picture of planning results without any further manipulations. It therefore makes it easier to pinpoint the factors that might be leading to poor planning results (e.g., delayed materials). This option offers forward scheduling followed by backward scheduling. The latter reduces slack between child and parent jobs wherever possible. This option provides for just-in-time planning. Forward scheduling is followed by backward scheduling (slack reduction), and the planning of all order items is postponed to the latest possible start date. This option allows for a supply of goods to customers as close to the due date as possible. Determination of calendric capacity — construction or extension of each work cell’s calendar, including, if necessary, a calendar for each machine in the work cell. Determination of lot size, taking into account process batch quantity, work order size, campaign size and minimum production size (as defined per part, per job or as a factory-wide constant). Calculation of required quantities for production — This is achieved by “expanding” the BOM of each of the ordered parts in the current planning group, down to the level of raw materials, and then subtracting floor inventory not already destined for another job (whether existing at the time of planning or deriving from earlier production planning sessions). In addition, available and anticipated warehouse inventory is taken into account (based on purchase orders and compressed lead times). Order splitting to distribute required quantities into lots, taking into consideration lot size, work order size, campaign size, and rounded quantities of excess inventory. Calculation of set-up and processing times, estimating the time required, per work cell, to set up and process planned jobs (concurrent or sequential). Workload balancing, utilizing, whenever available, processing alternatives to reduce the workload on the main work cell and main operation. For every job whose operation, work cell, part or tools has alternates, an attempt is made to distribute the workload as evenly as possible. Job sequencing per work cell,with the aim of minimizing set-up times and smoothing production in those work cells that have a tendency to become bottlenecks. The fuller a given work cell’s calendar and the greater its workload, the higher its priority in terms of job sequencing and the higher the priority of its child jobs. The system attempts to begin production at the bottleneck work cell (and on its child jobs) as early as possible in order to take advantage of any idle time at the work cell before it comes under pressure of constant operation. You have the option of sequencing with the aim of optimizing adherence to due dates or optimizing usage of work-cell capacity. Preparation of the issues plan. Before work orders and the issues plan are actually created, Priority generates a planning simulation for testing what-if scenarios based on the planning data. Once production planning has been run, results may be viewed in various reports. A decision is then made as to whether to put the plan into action or to make certain modifications — reorganize order groups (add or delete order items, rearrange groups, re-prioritize them) or add a work shift — and then rerun the planning program. • Pre-planning reports help pinpoint problematic areas, such as unrealistic job sizes or too many lots, which can lead to undesirable planning results. The reports include: job times and quantities for planned order groups; the number of lots for an order group; plant-floor inventory; production demands for the order group; and work cell hours for the order group. These reports are normally run prior to the activation of production planning. • Work plan reports display the work plan (Gantt chart), planned issues of materials from the warehouses, planned issues from one work cell to another and planned queue times. They include information on planned production times from a variety of perspectives (e.g., work cells, labor, production processes). • Quantitative reports display planned quantities of parts to be processed over user-designated periods (a day, week, month), as well as the quantities planned to fill specific orders. The reports include: work cell quantities by period, periodic quantities per work cell and job quantities per order item. • Period load reports display planned load distribution over the work cells. These reports can reveal those periods or work cells at which workloads are particularly heavy. • Critical path reports analyze the critical path of designated ordered parts. • Routing reports display the full routing of a given part and all its child parts or the routing of a given planned lot. As part of the Production Planning module, Priority offers a mechanism for optimizing lot sizes. This mechanism helps you handle a common dilemma encountered in work cells: on the one hand, a need to increase lot size as much as possible so as to save on set-up times; on the other hand, a need to decrease their size as much as possible in order to produce a smoother load distribution and to reduce cycle time and shipping costs. Once you are satisfied with the simulation results, you can run the Prepare Work Orders and Issues Plan program. This opens needed work orders and creates an issues plan for the designated period, serving as a basis for production control and purchase planning. Scheduling data are translated into production data by opening work orders for goods that need to be manufactured. Such work orders can then be released for execution of the first operation in the part’s routing. For each work order (including those opened for sub-assemblies), you can view the sales order (or orders) it is intended to fill. The resultant issues plan displays the quantities and dates on which issues are to be executed, based on anticipated shortages of the material on the plant floor. The system provides an interface that can be used to download the work plan data so that it can be displayed graphically in MS-Project. Data can be displayed there by orders or work cells.